There are many types of mice in the UK, including the House, Field and Wood Mice. Generally their body length ranges between 60-90mm, and the tail can add 100mm. Their fur colour varies between light brown and grey. Droppings are black, rod-shaped and 3-6mm long. Common places to find mouse droppings are under the kitchen sink, around central heating boilers and in roof spaces. Smear marks are dark grey marks left on surfaces by repeated contact with the oils in mouse fur. Nests can be found in lofts, under floorboards or in airing / boiler cupboards, and will consist of gnawed materials including plastic bags, card, paper as well as twigs and dried grasses. infested by mice, the mice will leave faeces and urine behind them, contaminating food and surfaces. 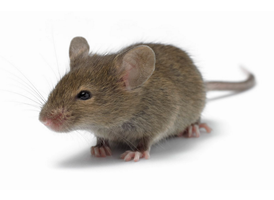 Mice are known to spread diseases to humans such as Leptospirosis, Weils Disease, Salmonella, Listeria. Mice can be difficult to get rid of without professional help. Our treatment involves up to 2 visits over a 4 week period.